We are Yale alumni who come from diverse backgrounds, including being 1st in our families or from underserved backgrounds to graduate from college or graduate school. We connect with each other to share our stories and have a positive impact on the lives of Yale students and alumni. 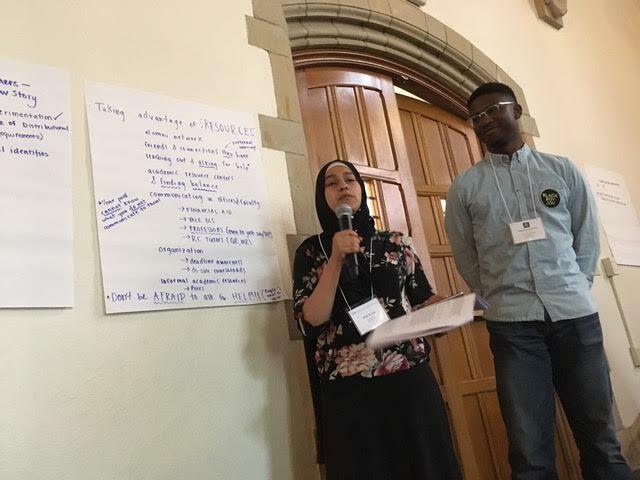 1stGenYale is inclusive of all diversity: race, ethnicity, culture, gender, nationality, disability, age, sexual orientation, religion, socioeconomic status, and family hardships. ❖ Organize career workshops and panel discussions on relevant topics to 1st Gen Alumni. ❖ Host an alumni gathering at your local Yale Club. ❖ Sponsor a Yale Day of Service site in your local community. ❖ Connect with the Office of Career Strategy to offer summer internships or full-time employment for Yale students. ❖ Be a mentor in the AYA Alumni & Students Pilot Mentoring Program. 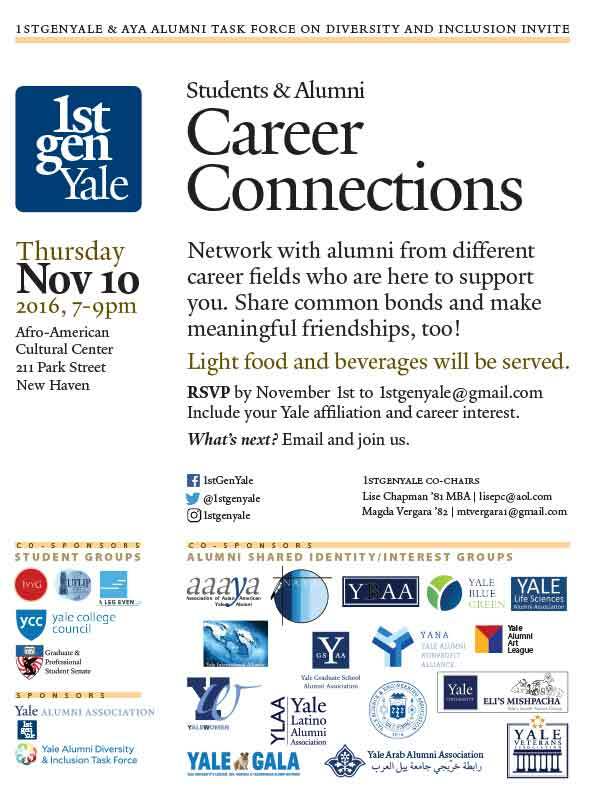 ❖ Share your life & career experiences with students through 1stGenYale networking programs held twice a year on campus. ❖ We are looking for alumni leaders to help us grow into a sustainable organization. ❖ Your ideas? Email us. We are thrilled that a new office has been established and meaningful programs are being developed to help our students make the most of their experience on campus and beyond. 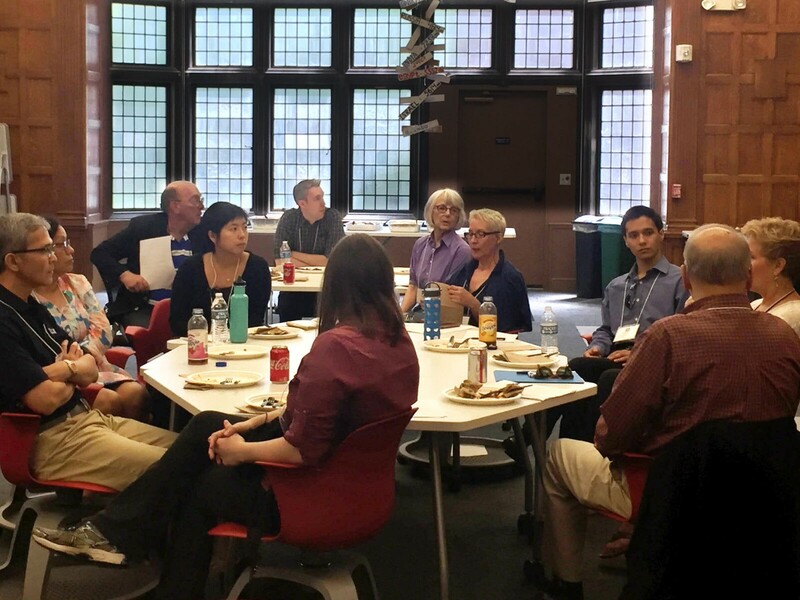 Beginning in the 2017-2018 school year, 1stGenYale alumni worked closely with Peter Huang ’18 and Dean Burgwell Howard on development of the Yale College (First-Generation Low-Income) FGLI monthly newsletter and the strengthening connections with alumni. 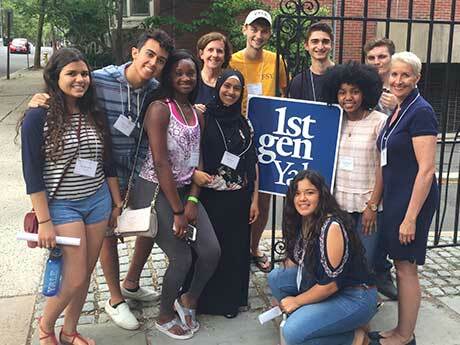 We enthusiastically support this new program to connect alumni who identify as first-generation and/or low-income with Yale FGLI students outside of campus. Given the inherent trailblazing experience of FGLI students, navigating college and life beyond can seem like an intimidating concept, especially when students perceive that they are the only ones in their situation. 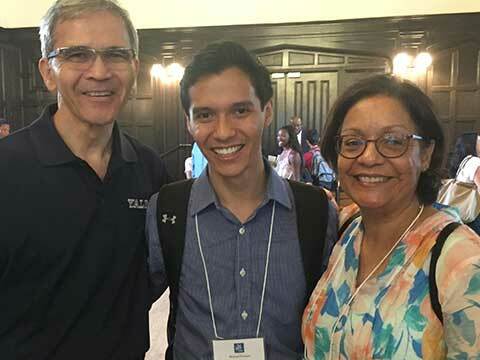 José López ’18, a Woodbridge Fellow, is spearheading this effort under the Yale College Dean’s Office and the Center for Teaching and Learning. Currently, he is collecting a list of volunteer alumni who are willing to have their information shared on the First-Generation Low-Income at Yale website . 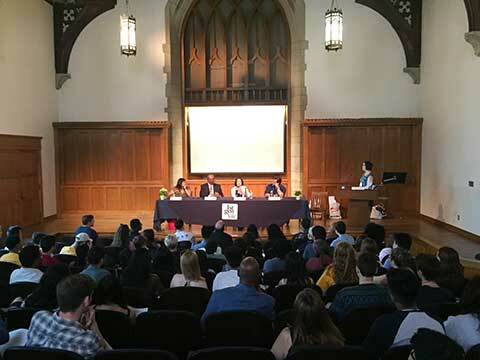 Students can then learn about and get connected to Yale alumni, and discuss life at Yale as well as career perspectives. Additionally, alumni can sign up to a monthly newsletter with updates on what FGLI students on-campus are doing, along with featured student profiles. Questions and comments about the FGLI Community Initiative can be emailed at jose.lopez@yale.edu. Thank you for your participation. By sharing similar experiences, alumni can provide valuable support to current students. Arriving at Yale, many of us 1st gen underserved alumni felt that we lacked informational, familial and financial support — causing us to feel isolated and alone. By telling our stories as former students and now professionals in diverse careers, we help students to know that they are not alone. We believe in them. We want them to know that they belong. We all belong to the Yale family. Our events, partnerships and initiatives will give you the many opportunities for sharing your story. Consider making a gift to the Yale College Dean’s Student Assistance Fund to provide needed financial support for urgent or emergency needs. To support students in the Graduate and Professional Schools click here and select your school. Beginning in the fall of 2016, first-year students from households with low assets and financial aid awards that include $0 parental contribution received a $2,000 Yale College Start-Up Fund to assist with one-time costs. In addition, the heads of the residential colleges also have small funds at their discretion to support students with emergency funding and to help upperclassmen with one-time costs. Those funds are distributed differently per college and often run out before the school year concludes. The Yale College dean’s office is looking for a fund that can help with these needs and would be distributed at the discretion of the dean of student engagement, Burgwell Howard. Purposes would includes, but not be limited to: clothing, computers, help with food costs when dining halls are closed, and airline tickets in case of sickness or death. Working with the AYA, we are actively encouraging all alumni give back by volunteering to be mentors for current students through the Alumni and Students Pilot Mentoring Program. Both alumni and students can indicate 1st gen background if interested. 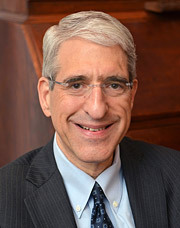 Contact Stephen Blum ’74. Join us at one of our annual events. 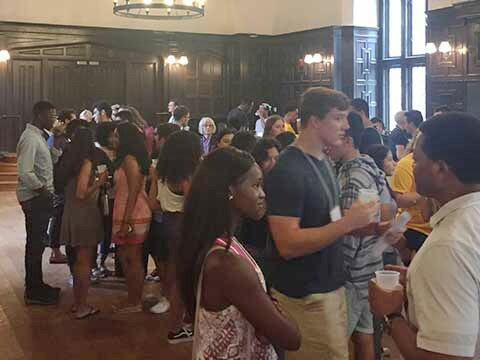 Working in partnership with the Office of Campus Life, our program invites alumni to spend the day with incoming Yale College students in the annual First-year Scholars program (FSY). Students meet alumni, many for the first time, and learn how to navigate Yale and beyond. We celebrate our new friendships with a lemonade and cookie reception. Alumni & students get-togethers are held during the annual AYA Assembly in mid-November. The 2016 and 2017 events were co-sponsored with the (AYA) Alumni Task Force on Diversity, Equity, and Inclusion. Discussions include career experiences, academic courses extracurricular activities and everything in between! 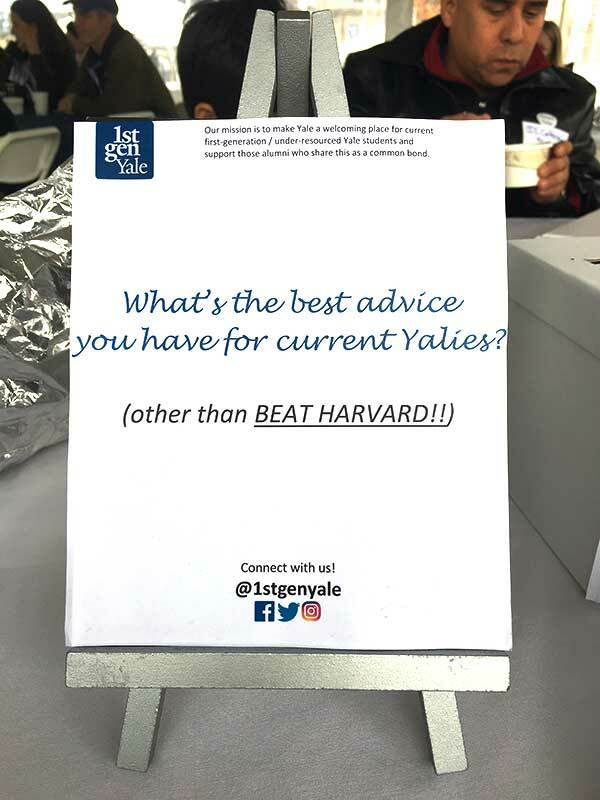 Initiated by an alumna, Yale College ’99 in November 2017, AYA Alumni Village pre-game 1stGenYale alumni get together table (alternating Harvard or Princeton games). 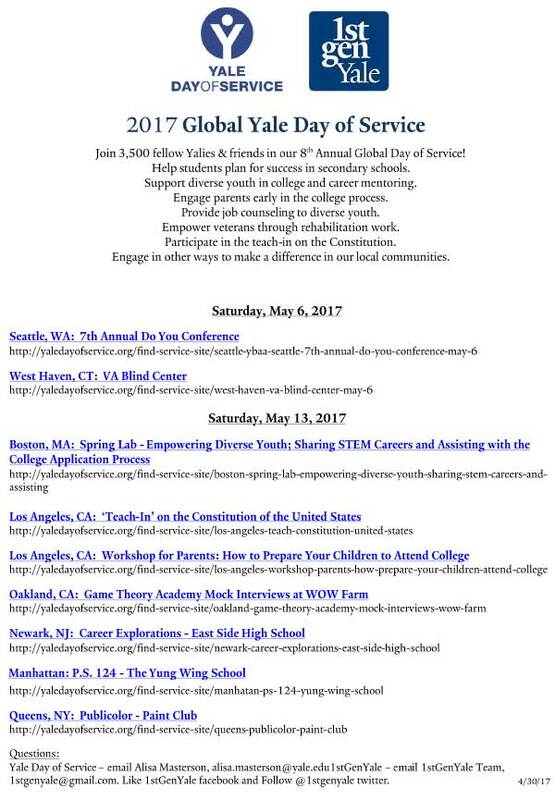 Partnership and promotion of sites with Yale Day of Service. Initiated partnership in 2017 and promoted 10 sites nationwide. How do you react effectively to it? 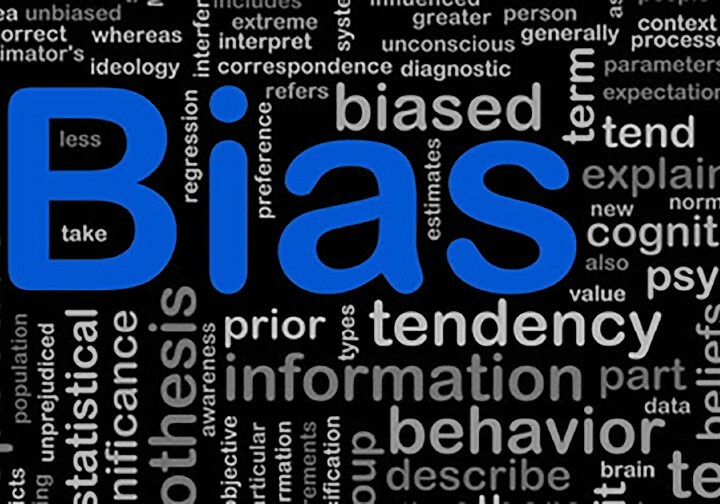 Join Dr. Darin Latimore, Deputy Dean & Chief Diversity Officer, Yale School of Medicine and Professor Claire Bowern, Professor of Linguistics and Chair of Yale Women Faculty Forum will join our discussion. Now in our third year, alumni joined us at the 2018 First-year Scholars at Yale. 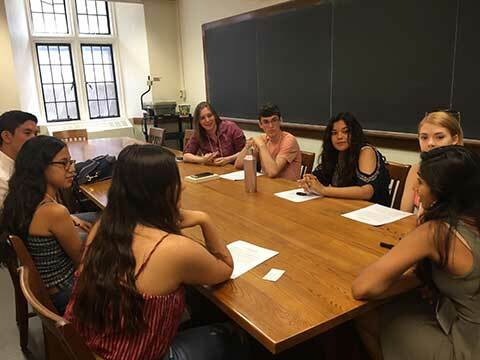 This summer program is designed specifically for incoming Yale College students from under-resourced backgrounds, many of whom are among the first in their families to attend college or graduate school. 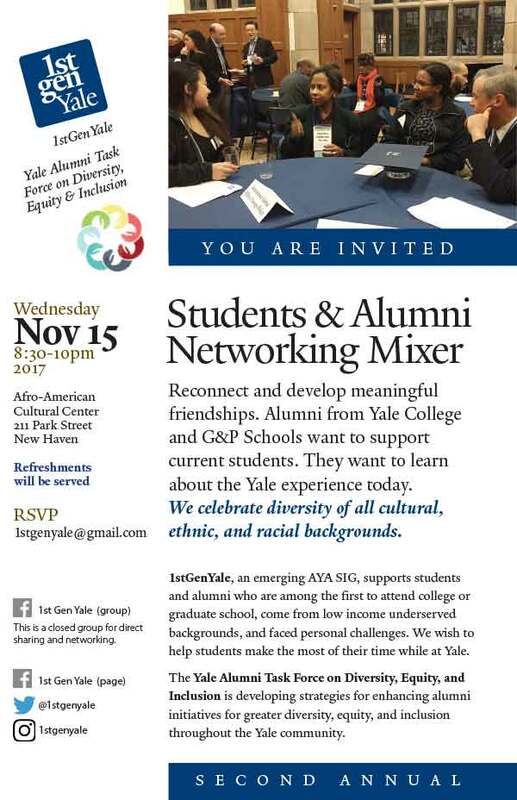 All Yale alumni are invited to participate. To prepare for their transition as Yale students, they live on campus for five weeks, explore campus life, sharpen their academic skills, and learn about Yale's resources, including alumni! By sharing similar backgrounds, we connect to each other with diverse cultural, socioeconomic, ethnic, racial, and gender backgrounds from all classes and schools to have positive impact on the lives of our students. PROGRAM | Alumni welcome lunch, moderated alumni panel followed by student discussion groups, and networking reception. To feel the magic, take a look at last year's 2017 FSY video. Additional Information Requested: To facilitate networking with our students, we will distribute information to all participants in advance. Please provide a short description of yourself, including your Yale affiliation, career, contact information (optional), and interest to meet incoming Yale College FSY students — in no more than 8 sentences by July 10. Contributions: 1stGenYale, an AYA Shared Interest Group, welcomes contributions from alumni and friends to support our programs. If you would like to make a gift, please send it to: AYA Shared Interest Groups – 1stGenYale, 1201 Chapel Street, New Haven, CT 06511. Thank you! Special Support for Alumni Participants: We hope to have a small amount of donated funds available to support participation by alumni who are in mission-driven non-profit, public service, or graduate school. For possible support, please send your written request to 1stgenyale@gmail.com no later than July 10, 2018. We celebrated our 10th Day of Service with local Yale alumni and their family and friends. There was something for everyone, even a virtual site this year. Thanks for joining us and helping to make a difference in your community! Los Angeles: Foster Care Awareness Month Event: Help Foster Youth learn how to succeed on the job! Our alumni team held the inaugural 1stGenYale conference on campus. This was the first time that we have come together as a new alumni shared identity & interest group, celebrating who we are, being first! Alumni from diverse cultural, ethnic, and racial backgrounds from all schools and years connected with each other, shared our stories, and developed meaningful friendships to continue well after the conference is over. Click here to download a PDF of the Program Book for the event. 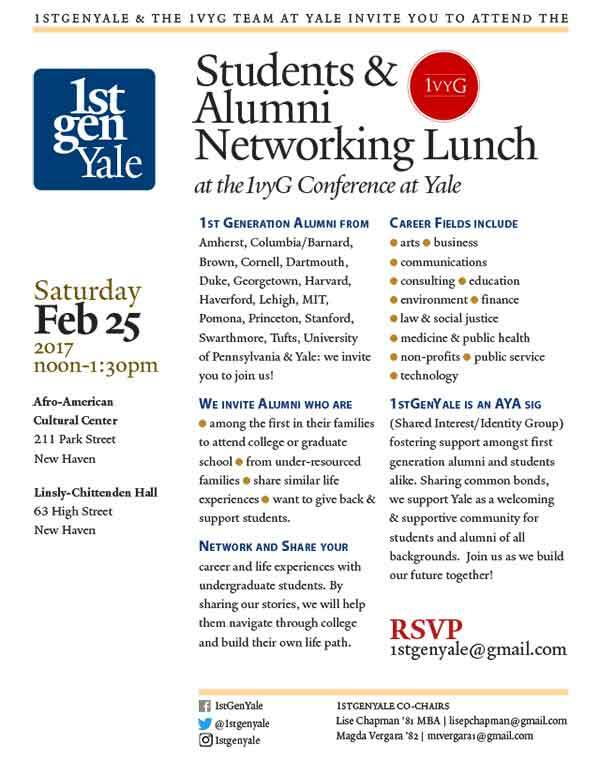 Hosted an All Schools’ Students & Alumni Networking Lunch, 1vyG Yale Conference, February 25, 2017 with 120 alumni from 18 colleges & universities and 400 representative students. 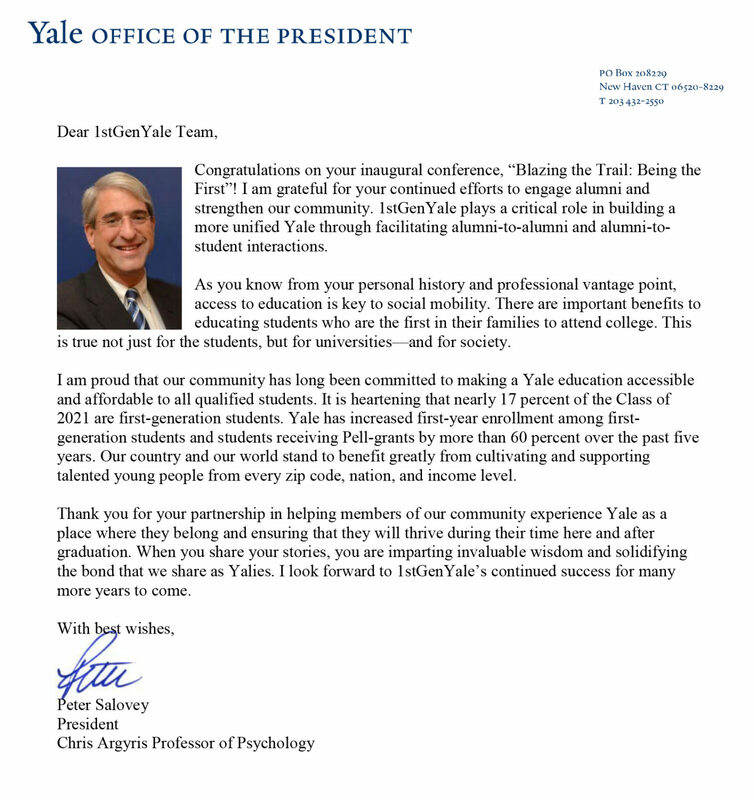 As alumni from all schools in President Salovey’s One Yale, we are a family. By sharing our stories, we connect to each other and support students to help them navigate and take advantage of all of Yale’s resources, including its alumni. The annual AYA Board of Governors Excellence Awards recognize the superior accomplishments of Yale’s classes, regional clubs, shared identity and interest groups, and graduate and professional school alumni associations. The successes reflected in these prizes raise standards and contribute to the growing impact of alumni activities throughout the entire Yale family worldwide. 1stGenYale’s award for the 2017–2018 year, was presented at the AYA Volunteer Leadership Awards Reception on the evening of Friday, November 9. 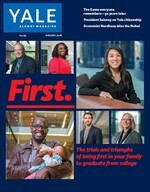 The Yale Alumni Magazine cover story for Nov/Dec 1028 features 1stGenYale. My favorite time of year has arrived! Last week, classes began, and I visited one of our residential colleges — I won’t say which one — for a quick lunch. Students were discussing problem sets, schedules, roommates, and club meetings over salads, pizza, and froyo. Our students are fully immersed in the daily life of Yale. For me, the beginning of an academic year is a chance to reflect on the work that has led up to this moment. I am very proud that we broke three admissions records for the Yale College Class of 2022. One in five of these new students is the recipient of federal Pell Grants for low-income students. This represents an increase of nearly 100% from just five years ago. In addition, 284 students (18% of the incoming class) will be the first in their families to graduate from a four-year college. Again, this is a substantial increase (75%) from five years ago. Third, we set a new record in our yield (the number of admitted students who chose to attend Yale), reflecting the exceptional work in education and research that is taking place across the university. As we celebrate these achievements, I am happy to share with you a video, “Blazing the Trail: Being the First,” documenting the inaugural 1stGenYale Alumni Conference held last April. I had the privilege of speaking at the event, as did my wife Marta Moret ’84 M.P.H. — herself a “first-gen” Yalie. I am excited about this initiative, which brings together alumni and students who are committed to making Yale ever more welcoming, inclusive, and excellent. Yalies are creative problem-solvers. From building the world’s first 3D-printed “supercar” to spearheading educational and health programs in South Africa, you can read about how our alumni are applying what they learned at Yale to transform communities worldwide. As entrepreneurs, business leaders, and volunteers, they are imagining — and creating — new possibilities for the future. Their stories remind me of the incredible promise of every student at Yale. This year, I told our newest Yalies that we are all “citizens of Yale sharing a common purpose — the pursuit of knowledge and understanding.” Our curiosity, our eagerness to explore new ideas, and our commitment to improving the world connect us as members of this community. Thank you for all the ways you mentor and inspire the next generation of Yale students and scholars.